1 - Start with damp hair. I dried the back out a bit more and set it on a curler to acheive some extra volume. Part hair far to one side. 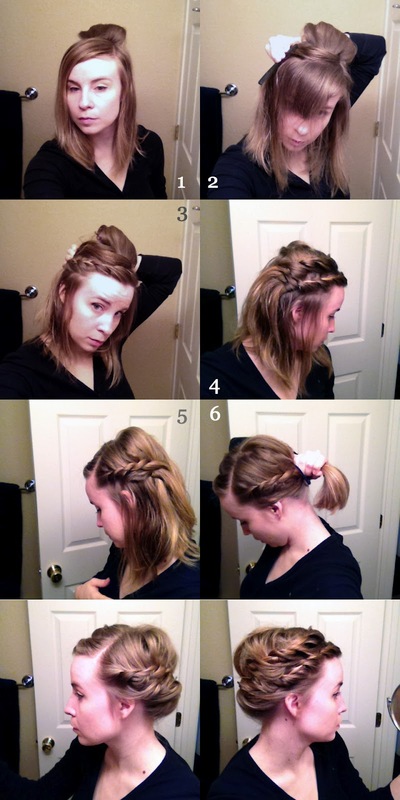 2 - Using a comb, isolate the front section of your hair that you plan to braid. Clip excess hair back. 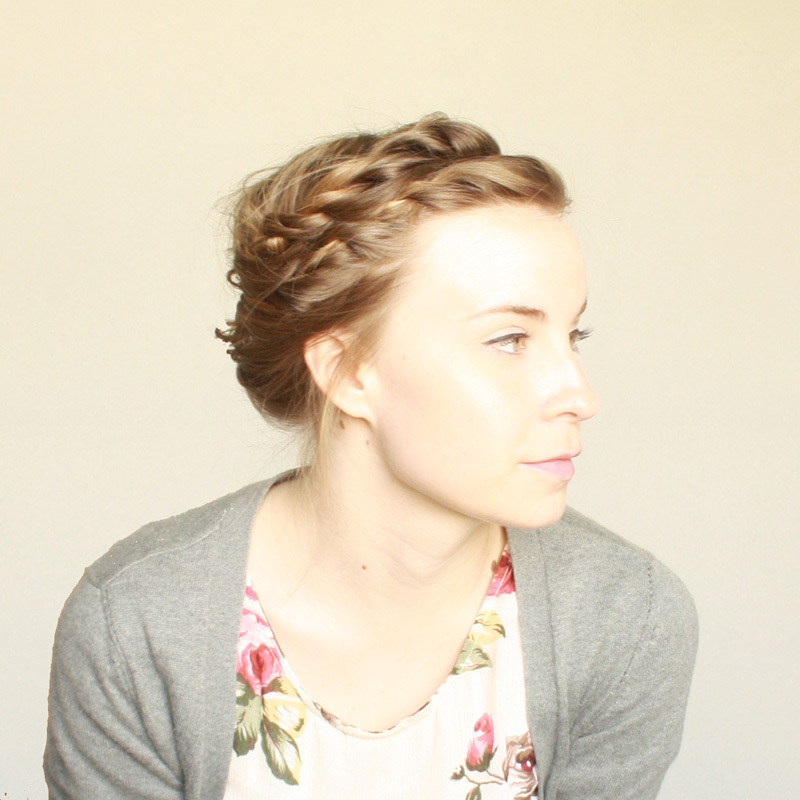 3 - "Braid" first section and bobby pin it. The technique I used is not exactly a braid because I can't seem to french braid the front of my hair, now matter how hard I try. Click here for the video tutorial explaining the quick two strand twisting method I used. 4 - Release the section of hair you pinned back, and braid using the same technique as above and pin. 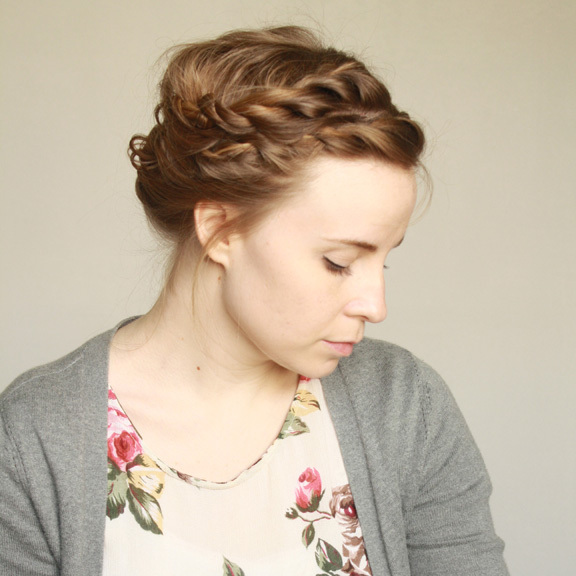 5 - Make one braided section on the opposite side of your head and pin. 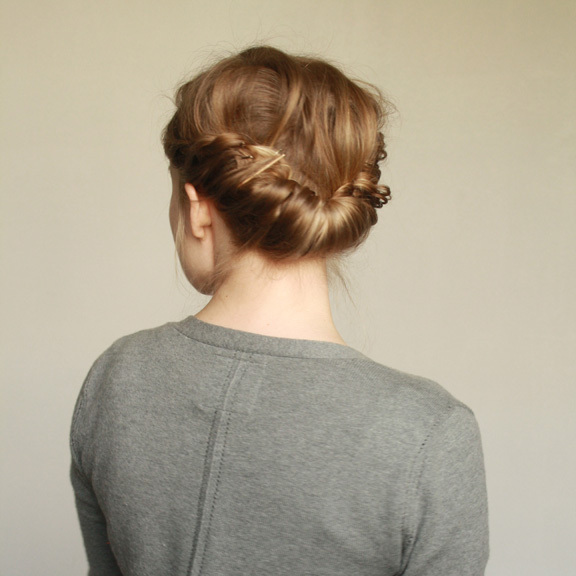 6 - Put your hair in a pony tail to prepare for the gibson tuck. Please click here for the simple gibson tuck tutorial. I used several large, heavy duty bobby pins to secure the tuck and they held it so much better than the small ones. I have been wearing my hair like this for three days straight and don't anticipate that changing any time soon. And because I was supposed to be doing other things, I made this cinemagraph instead. The whole look only took me about 10 minutes to do. I am also proud to say that I can sleep in the hair style, secure a few stray hairs and I am good to go for another day. This is truly good news. You pretty lady, I love it! Come do my hair, okay? Done! It's only a plane ride to Portland, right? I miss you, my dear. Gorgeous! Regular blog stalker/reader here (my son Will and your Tate are about the same age), first time commenter. I also wear my hair in the Gibson tuck from time-to-time, using the same tutorial. I wanted to give you a quick tip - instead of using a handful of bobby pins to hold it in place, I've been using Goody spin pins. They're great! Kathy, I've never used Goody spin pins, I will have to check them out. Just wanted to say that I got these spin pins and they are awesome! Plus, they're much harder to lose than bobby pins. Bonus! love this tutorial. such a cute style. I am definitely going to try this one out. I love it! This would be perfect, as I don't like wearing my hair down much because I'm still losing a lot of it (I'm three months post partum), and my babies will often pull on it if it's down. I am definitely going to have to try this out, so thanks! Exactly! Hope you like it. I've been looking for new ways to wear my hair up at work other than a bun. I love this and am trying it out today. It has a very romantic look to it. Love it! But I'm afraid I struggle in the hair department and don't think I could ever get this to look right on my own head. Cute!! I wanna try it. this is gorgeous! i'm so impressed! This looks great! I tried this morning, not terrible for a first attempt but I'll keep practicing. I didn't do the gibson, mine is just a messy bun in back, so that's next! This crazy cool Madeline! Love how it turned out! Looks beautiful. OH my gosh, what a fabulous rendition of the Gibson! I will have to try this immediately! Thanks so much for linking to me, as well. I love finding stuff like this, and THIS creative sharing is what the internet is all about! Okay, you gotta help a sister out. How do you get your tuck to lie down so well against your head? When I do it like Sara does I just end up with these two weird pieces that stick out on the sides. Are you getting that too? Using lots of bobby pins? I think it has to do with it being damp. I got pretty pissed myself trying to get it to work this morning on dry hair. And yes, there are quite a few bobby pins involved. Try pinning the twists down in several places before the gibson. Also, when I loosen my pony tail I try to loosen just the center of the hair, leaving the sides as tight as possible in the pony tail holder. I cannot wait to try this and i am def going to share with my readers! ugh... this just broke my heart. i think my hair is too heavy for this. it's so unsuspectingly heavy that it wouldn't hold up in the back. maybe just a regular bun? i need a hair person to come over everyday and save my life. Sorry to disappoint, but that's just original Chapstick!